I want to welcome all of you here today. Ba mhaith liom aitheantas speisialta a thabhairt d’ár gcomhordaitheoir ar Éire Aontaithe, Lucilita Bhreathnach agus an foireann a bhí ag obair leí le roinnt míonna chun an comhdháil seo a chuir le chéile; an comhdháil i gCorcaigh ar an tseachtain seo chugainn agus atá ag eagrú comhdháil i nGaillimh i mí Dheireadh Fómhair agus sa tuaisceart níos moille i mbliana. These conferences are part of a strategy by Sinn Féin to raise awareness and encourage a national conversation around the goal of a United Ireland and create inclusive platforms for an engagement on this crucially important issue. 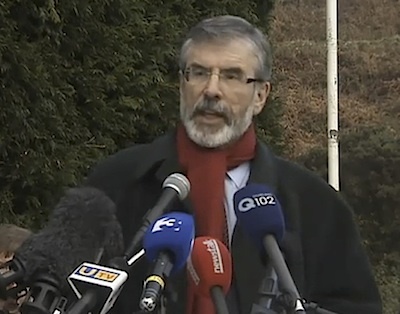 In recent years Sinn Féin has held conferences in London, in the United States and in Canada. These were part of a process of consciously reaching out to the millions who make up the Irish diaspora. All of the conferences were well attended and have generated activity and momentum around the Uniting Ireland project. Our friends in Irish America have been particularly successful and resolutions in support of Irish unity have been passed at State, County and City levels in many areas. Beidh ról an diaspóra, mar a bhí leis na céadta bliain anuas, rí-thábhachtach chun Aontacht na hÉireann a bhrú ar aghaidh agus a thabhairt chun críche. But of course, it is here on this island that the arguments and debates and persuasion must take place. This conference, and the one in Monaghan last November is a part of that process. And it is appropriate that it is held here in the Rotunda. This is in the heart of Dublin. Is ann sa chathair seo a bhí an Ghluaiseacht Éireannaigh Aontaithe ag pleanáil agus ag cumadh éirigh amach; an áit ar eagraigh Éire Óg agus na Fíníní agus an áit ar thárla Éirigh Amach 1916. All around us are the streets and lanes and buildings that are the backdrop to the Easter Rising. A few yards away is the place where Tom Clarke’s shop was, and where the IRB leadership frequently met and planned the Rising. The GPO is a few minutes walk down O Connell Street, and behind it is Moore Street, where, after days of bitter fighting, the remaining leaders of the Rising met in number 16 and agreed the surrender. Outside these walls the Volunteers of that era defiantly paraded to the British held barricades and from there to prisons and prison camps in Britain. On the edge of the Rotunda is the spot where British soldiers stripped Tom Clarke naked after his capture in an effort to humiliate him. But Tom had endured worse in his 15 years in English prisons. And behind us is the Garden of Remembrance. A place of pilgrimage for those who wish to pay their respects to the fallen heroes of Irish’s long struggle for independence and freedom. It was here that the English Queen came a short time ago to lay a wreath in honour of those brave men and women who died for Irish freedom. Many of the heroes remembered there were executed by British crown forces. The laying of the wreath was a recognition that they fought in a just cause. But of equal significance was the Proclamation, read that Easter Monday by Padraig Pearse, standing outside the GPO. The principles and values, the philosophy and ideals which it aspired to are what inspire this generation of Irish republicans. It is a freedom charter for this whole island and all the people who live here. The Proclamation sets the standard by which the modern Ireland of today must be judged. It was a Proclamation for all of the Irish people – not some. It was for whole of the island – not a part. Those who took up arms that spring week in 1916 knew of the danger posed by the threat of partition and where against it. Connolly in particular had famously warned against it. He argued that partition ‘would mean a carnival of reaction both North and South, would set back the wheels of progress, would destroy the oncoming unity of the Irish Labour movement and paralyse all advanced movements whilst it endured’. Ach ní raibh siad siúd a d’Éirigh Amach beo le cosaint a dhéanamh ar an Fhorógra agus ar neamhspléachas na hÉireann nuair a tharla an deighilt. In the 90 years since partition it has distorted and infected politics and economics on this island. Partition established two conservative states ruled by two conservative elites. Corruption was soon rife and those in control ruled in their own self-interest and lined their pockets at the expense of others. On this small island of some six million people two states and two governments were created. There is a significant duplication of public and private services, two sets of currencies, and two tax systems, laws and regulations. It makes no sense politically, economically or socially except as it was at that time – part of a counter revolution. Much has changed since then and today, and at a time when every cent or pence is needed to rebuild the economy, this duplication of government and public services is wasteful and costly. The most recent live register figures for this state show that there are at least 443,400 people unemployed while in the north the figure is around 60,000. At the same time 50,000, mainly young people, will emigrate this year – 1,000 each week. There is an opportunity to change all of this. It is inefficient that on an island this small there are two contending political systems; two health services; two education structures; and two economic systems competing with each other for jobs and investment. The Good Friday Agreement provides a roadmap to build all-island approaches. Already there are many who accept the logic of an all-island economy, in which all of our interests in health, the environment, education, agriculture, transport, job creation, taxation and strategic investment, are planned together. Uniting Ireland makes sense. Together is better. Sinn Féin is about building that new Ireland for the 21st century. Poblacht 32 contae a chumhdaíonn prionsabail féinchinnidh agus cearta, prionsabail comhionnanais agus daonlathais, prionsabail a spreag cuid laochra 1916. Sinn Féin seeks to erase the border and its adverse impact on the lives of citizens, through practical co-operation and imaginative policies, including the full utilization of the all-island institutions that were created by the Good Friday Agreement. In the negotiations which led to the Good Friday Agreement Sinn Fein succeeded in getting the British to scrap the Government of Ireland Act through which it claimed jurisdiction over a part of Ireland. This was a significant development. Last week in his speech to the Assembly the British Prime Minister David Cameron repeated this position. He said, ‘as the Agreement makes very clear’, the constitutional future of the north does not rest in his hands or those of his government but in the hands of the people. The reality is that contrary to Margaret Thatcher’s claim many years ago, the north is not as British as Finchley! The Good Friday Agreement and subsequent agreements have mapped out a legislative and democratic route toward uniting Ireland. Is é an tasc atá againne mar phoblachtaigh ná tógáil ar an deis seo agus an neart pholaitiúil a chruthú i dtreo an Phoblacht nua. That means creating a national – all-island – conversation about the kind of new Ireland citizens want to serve the common interest. This debate shouldn’t be confined to the failed political boundaries set by partition. A new Ireland must be fully inclusive. That means reaching out to unionists and seeking to persuade them that their interests will be better served in a United Ireland. Sinn Féin wants a republic. Our belief is that the interests of citizens and society on this island will be best served by a republican system of governance based on the rights of people. But that is a matter for the people to decide. There are other models which can be considered, including federal arrangements. They could serve transitional measures or as governmental systems in their own right. It is also important that as part of this process of building a new future that there is an effective process of dealing with all legacy issues. In Sinn Féin’s view the Irish and British governments should invite a reputable and independent international body to establish the creation of an Independent International Truth Commission as part of an effective truth recovery process. A key part of the debate about the future must be a discussion with unionists about what they mean by Britishness and how a new Ireland – whether or not it is a Republic - can accommodate this. It also means mapping out the steps necessary in the time ahead to progress toward uniting Ireland. The Taoiseach commissioning a Green Paper on Irish unity which would address all aspects of this national and democratic project including its political, social, economic, cultural, legal, administrative and international dimensions. A Joint Committee of the Oireachtas on Irish Unity to monitor, assess and report progress on its implementation should be established. And a new constitution – discussed and debated and agreed by all sections of people on this island, which would enshrine citizens rights in law. There is a yearning in Ireland today for a new way forward. Citizens north and south are looking for something new. Tá siad ag cuardach modh nua chun ár bpolaitíocht agus ár eacnamaíocht a bhainistiú. Tá siad ag iarraidh saoránaigh a chumasú. They want a society which is equitable and just. The 1916 Proclamation is the template for this. It used language that was appropriate for that time. We need a new all-Ireland constitution that enshrines the principles and ideals of 1916 and gives expression to them for the 21st century. Real social, economic and political change is not easily achieved but all those who have a genuine commitment towards building an Irish Republic worthy of the name must work together towards that end. That work can start now.